He may not be as famous as Steve Jobs whom I've done a previous memorial post for when he passed away on Oct 5, 2011. In fact it's been over a year since Aaron passed away on Jan 11, 2013 as I only got to know him recently as explained partially at the end of an earlier post on the date 24 April 2014. Details about his life's work and achievements can be found at wikipedia here. Aaron was born in the time period known as the Y generation, similar to all the children in our family ie. born roughly in the 1980s to the middle of the 90s. These are usually the children of Baby Boomers and people in early Gen X. Generation Y grew up with many world-changing events including the rise of mass communication and the Internet as described in a generation chart here. He grew up to become a computer programmer, probably a Geek with good programming skills and even hacking skills. This could be naturally so as his father Robert Swartz had the background of a computer programmer who started a software firm in Chicago, Illinois. Now Aaron had hacking skills which I had seen in a couple of our top programmers who had incredible high IQ scores and therefore can understand and appreciate the calibre of Aarons computing skills. He was therefore involved in the development projects of a number of breakthrough products like the web feed format RSS that essentially is used to to publish frequently updated information for blog entries, news headlines etc. It was the project that he was involved in with the organization of Creative Commons that I found his name while reading a website of archived books using the Creative Commons licence. It was Aaron's later work focused on sociology, civil awareness and activism that eventually led him to serious trouble with the authorities for his act of downloading and distributing information without authorisation. According to the wikipedia link of his life given above, he was charged by Federal prosecutors with two counts of wire fraud and 11 violations of the Computer Fraud and Abuse Act carrying a cumulative maximum penalty of $1 million in fines, 35 years in prison, asset forfeiture, restitution and supervised release. 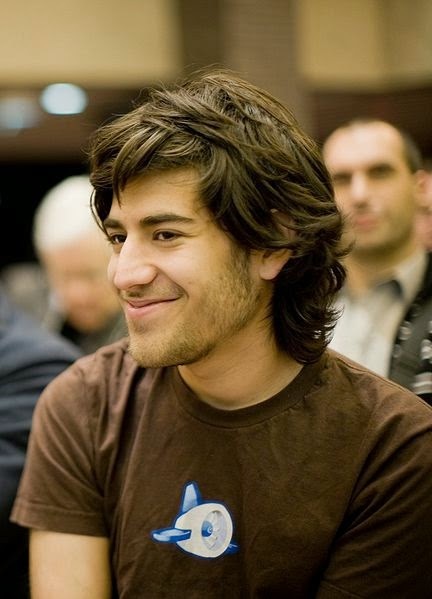 Two years later, two days after the prosecution denied his lawyer's second offer of a plea bargain, Swartz was found dead in his Brooklyn, New York apartment, where he had hanged himself. A film guide can be read here. There seems to be some injustice by the American authorities exercising their legal powers in prosecuting this young man who seem to have not committed any criminal acts for his own personal gain! 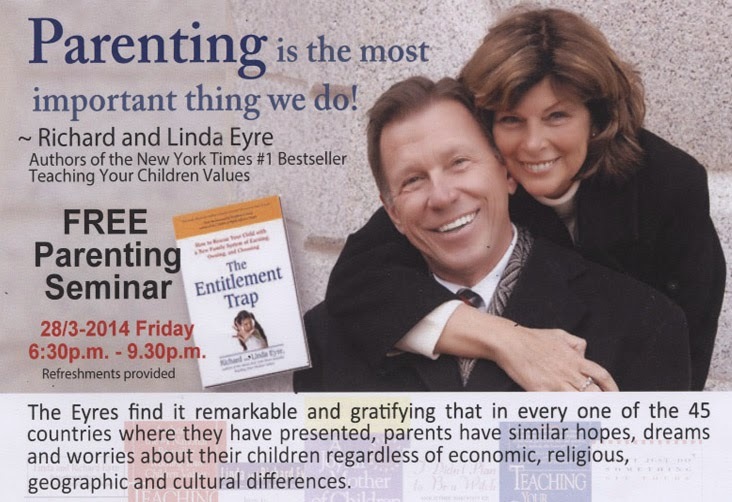 They also have a blog following the title of the book ie The Entitlement Trap and one can read this introductory post to know why parents say “Entitlement” is the biggest problem of this Generation of Kids. But there is a challenge for the Y generation to attain such a balance. They are the generation that have become soft from a time like in the computer era where hardware dominance gave way to software supremacy, creating a world wide web that figuratively captures the hearts and minds of the next generation. This virtual world can blur the divide between what is good and bad, and users expect lifes blemishes can be easily removed with instagram! We have to watch out for this whether we're old or very young as it can come at a time of our lowest moments in life. I remember when I was very young, my father had retired and was given a round the world trip by the government, with my mother accompanying. At home being the youngest without them, I was boycotted by my youngest sister, next oldest to me, who teamed up with our sister-in-law to leave me out from their fun and games at home. Tears swelled in my eyes as I walked out of the house to the empty land next door and just sat there by myself, filled with lots of self pity till it was late and past dinner time! Out in the darkness, my only brother in the home came out to me and extended his hand of compassion with a soothing voice to tell me, let's go back home and have dinner! I just rose up and never remembered anything more about my sadness. However I've never forgotten that single event of self-pitiness in my life and took a different course to quite the opposite thereafter to create a balance in my life of self reliance. 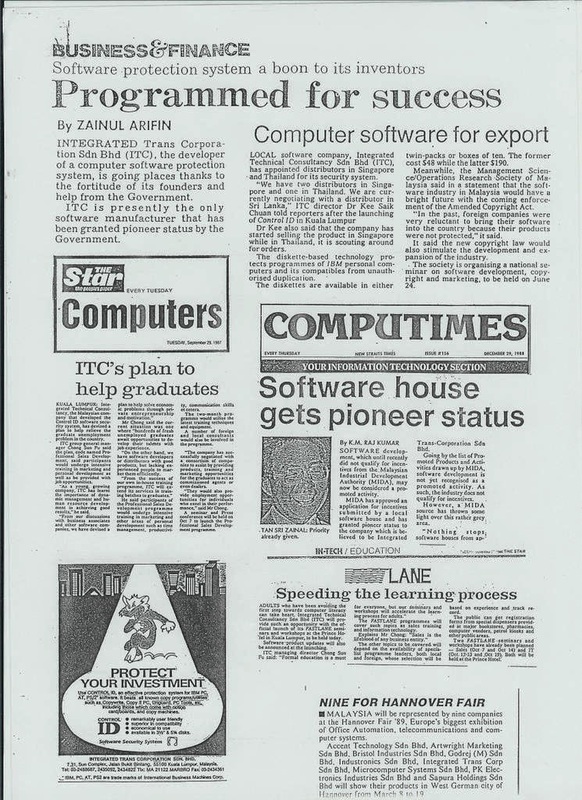 I should know that as I was one of those pioneers who brought in the first PCs into the country to help every office have one with the vision that every home would also have one too. I had also exposed them early to our children with mindfulness to be aware that how it is used is more important than what it can do. I was always careful to share with others that you cannot replace good human judgement and experience with computers in business in the same way it cannot replace good guidance and lessons from parents to the Y generation kids. 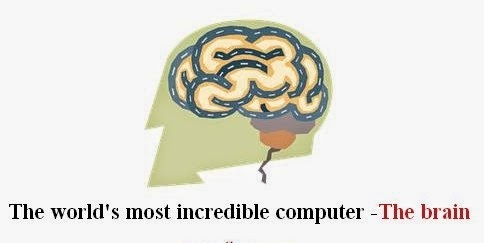 The computer was invented as an extension of the brain to facilitate repetition of productive tasks in the beginning and later on after perfecting the task of data processing and management shifted to facilitate data or idea creation instead. 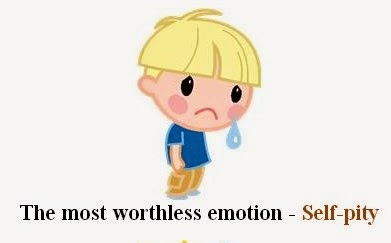 This is the part that we have to be careful for the brain is neutral to good and bad but if it is overexposed to routines that mould the brain towards certain negative ideas, beliefs or emotions, it could be hard to undo them just like undoing alcoholism or drug addiction that hits modern societies. 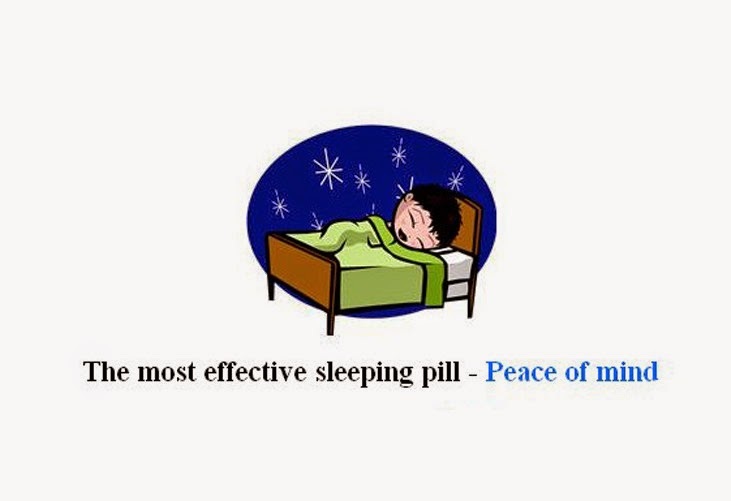 Are more people finding it harder to sleep early or enough in this internet era to even require sleeping pills? See how he responds to his mistakes from an accurate repeated response from the computer to say, "You are Wrong!" I'm glad that later in life he did get an A in his A levels for music composition where he extensively used music software to assist him. I am sure he never would have expected that with the advent of Youtube and Facebook, his voluntary missionary service for the Church in the UK would result in him singing on the internet media as the general authorities of the Church themselves made their presence in Facebook. So it seems that raising Y Generations kids is a test of the ability of parents to provide a HEART filled with love that is soft or soothing balanced with a MIND capable of teaching correct principles, even the hard truths of life. Individuals are supposedly to be built with these two components to live a balanced life. It is interesting to note that somehow parents of children come naturally in a pair of a Male and Female parents who have a tendency to possess these apparently opposite traits. Put in Y Generation simplistic computer terms, the male could perhaps be providing the mindful focus of developing the hardware thoughts of a child while the female could be the one providing the heartfelt influential software feelings to be of a compliment. This may be an overly simplistic model to explain parenthood but add a spiritual component that can fill the heart and mind to direct it may sufficiently make the model sophisticated enough to be worth contemplating. This is what I did when I started a series of writings entitled 'My Heart and Mind' that has covered intricate details that can be said to be simplified but yet challenging to be fully understood or applied. Don't forget to click 'Next' at the bottom of each page to advance to the next page of thoughts I have shared in the website I had referred to. A married couple, both law professors from Yale and accomplished writers, where the wife Amy Chua became known as the 'Tiger Mom' for her book entitled 'Battle Hymn of the Tiger Mother' recently came out with a controversial new book that makes sweeping like conclusions of different groups of people in America to explain why one group does better than the other. Their book has a simplified title of 'The Triple Package.' I bought it at a timely moment when my thoughts were focused on the subject of raising Y generation kids, not knowing that it would have anything to do with raising children. It is really their observation of how 3 qualities have created groups of people in the United States who have become more successful than other groups despite all the challenges or downturn of the economy that the country has been facing. Some of these groups named include the Jews, Mormons, Asian Americans and others. 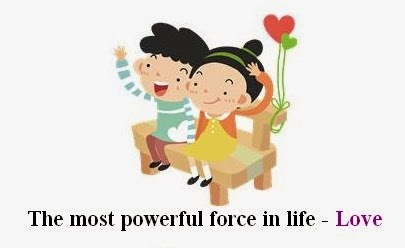 You may like to click the link given above that has a video of the couple giving detailed explanation of the 3 qualities emphasized in the book. It seems that these groups show a superiority attribute yet possess an insecurity trait which gives them the extra drive to succeed. They call the third quality 'impulse control' that can be seen as a strength of these successful groups of people or culture. Being a Mormon and also an Asian though not American, I can totally relate to what they have independently observed as qualities in our culture, religion or race that apparently has been recognized today as producing a more successful group of people in America. Furthermore with reference to my own writings of my Heart and Mind mentioned earlier that relates to the Body Mind and Spirit of Man, I could explain how the 3 qualities have come about in the context of the ancient philosophy of the Body Mind and Spirit. I believe the Superiority with Inferiority qualities come from having a Spirit that is strong and the Body that is weak with the Mind trained to handle the task of emotional or impulse control as the writers call it. It seems that raising children has become more sophisticated as each generation of time goes by! Indeed X generation parents may have to do more than what their predecessor parents had to do to raise successful children the same way the Y generation will have to follow suit to tackle the Z generation of their own creation! It is timely as this post comes to its natural ending as Mother's day befalls us. Let us therefore move to focus about the contribution of the female motherhood aspect of family roles in this next post. The last blog post or Family History Part 3 before this post can be viewed here, which will contain reference to Part 1 to read how it all began. This may be useful to read as this post, at this time of writing, has just started and will take time to be filled with more content of discoveries and stories. 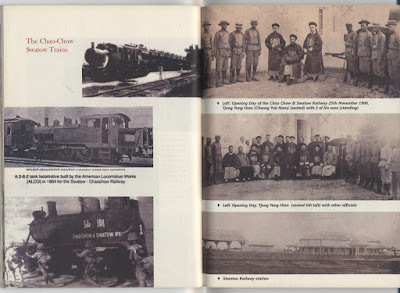 This post has the objective of connecting our family history to important events, persons and culture learnt from studying China's history. For a version in Cantonese click here. However if you're one filled with a hindsight of spiritual guidance and adventure with a foresight of the best is yet to be, you will surely keep on persisting. What used to be rather a boring task of data-mining work becomes a journey of learning not only of finding out who your ancestors are but you also soon begin to immerse yourself into the world they lived in. Knowledge of the geo-politics and culture of their time begin to seep into your inquiring mind to even cause a transformation in you from what the spiritualist author Gary Zukav calls a 'five-sensory human' to become a 'multi-sensory human'. Seeking our family tree inevitably leads to a discovery of the history or origin of our people or a race and culture that existed long before we were born. I was born in the country of Malaysia as a 2nd generation born Chinese very much influenced by Western culture and the English language as my father was one who climbed up from poverty to become a self made man due to the opportunities of a British education in a local school and later tertiary education in the UK. That local school, Penang Free School, was the first English-medium school in South East Asia and is the oldest recorded school in the country. I on the other hand was transferred from a local 'Pasar Road' primary school to a Catholic school at St. John's primary and continued later to the secondary or middle school of St. John's Institution run by the La Salle brothers as recorded here. 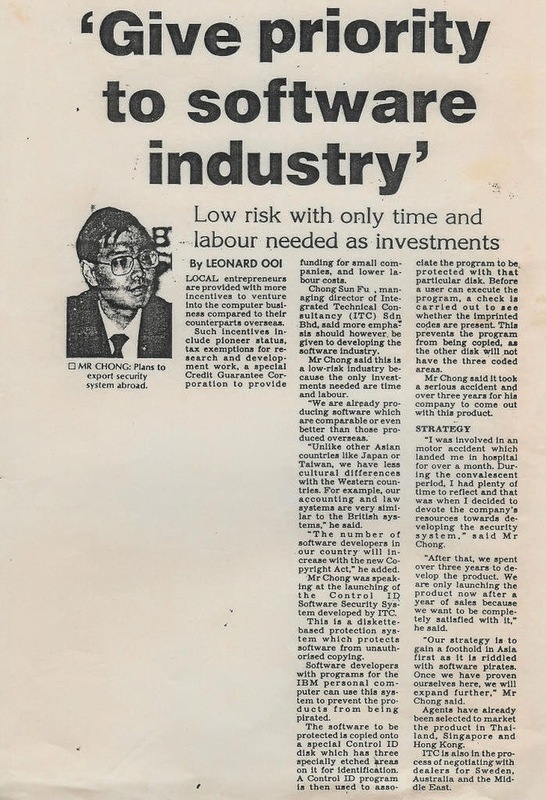 Though a Chinese, being raised in the English-medium in a country that later changed the national education system to Malay-medium(change explained here. ) with restrictions for it's citizens to visit China due to the threat of communism in the post 2nd world war era, I grew up with no contacts in China and very little knowledge about my family Chinese ancestry until I was in my twenties. I had no appreciation nor understanding of what being a Hakka meant as though I knew my father was of Hakka descent, he couldn't speak the dialect and I only learnt Hokkien as both my parents spoke it as they were born in the island of Penang where the inhabitants were made of primarily Hokkien speaking people. Being born in Kuala Lumpur I also learnt the Cantonese dialect as that was what most Chinese people spoke to each other in unlike the southern state of Johore who like Singaporeans speak mainly Mandarin to each other if they don't use English. But my knowledge or ties to China was still limited. I thought I would narrow the gap by sending our first two girls, being the 3rd generation born Chinese in Malaysia of our family tree, early to Chinese schools for their elementary education where they would learn Mandarin. Ironically, our oldest daughter Fei in her early teens remarked one day that she felt she was not a Chinese but an American! I figured out that speaking English at home with my inherited western culture from the British in Malaysia together with her mom's from Singapore and our close friendships to American expat Church members in KL may have caused this! I read later in her blog writings that it was only during the 3 years working in Beijing, after her studies in the US, that she achieved self-actualization that she was indeed a Chinese and accepted her Chinese name as Fei instead of Faye! She had also visited Hainan island in China helping to trace her family history on her mom's side. 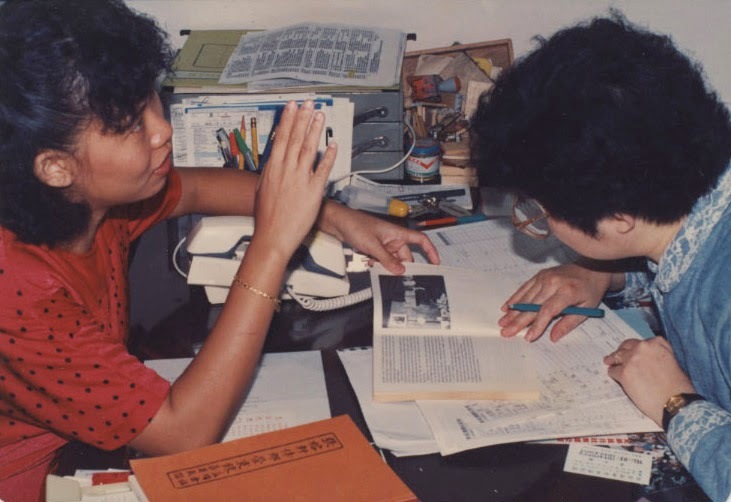 Marrying a wife from Singapore who was fluent in English as well as Mandarin and was also a member of our Church interested in family history work provided a real boost for discovering my own Chinese ancestry as well as hers. Photo taken in April 1990 in our Taiwan trip recorded here. The story of how she already got involved with helping me find my roots early during our courtship days to continue till after we bore 6 children in our marriage is comprehensively covered here. Her own account of miracles she experienced in doing family history work for her own ancestors in a journey of journeys covering Hawaii, Salt Lake City and Seattle can be read here. After her passing to what we call the Spirit world in our church, like of other religions, I believe a connection continued between us in the spiritual sense. It started with me continuing to mind talk to her when I'm exercising around the running tracks near our home in Singapore with early concerns for the younger boys continuing their life and education on the island state without their mother. Maybe it's the same way I relate to God or my Heavenly Father also. I know he already knows my heart and mind so I often just mentally converse casually to him like as if he was close by, believing in his omniscience and omnipresence. I tend to do that with my wife too who knows me closely as well and has shown me unconditional love during her lifetime with me. With her presence now in the spirit world, I believe she even knows more about me now than I know of myself so I do talk to her in consultation of different subjects at times and I believe I do receive a response from her or an inspiration at times. The difference I believe compared to deity is that she may not have an omnipresence ability and we may only connect on special occasions only or when there is a matter of great importance to relate to. 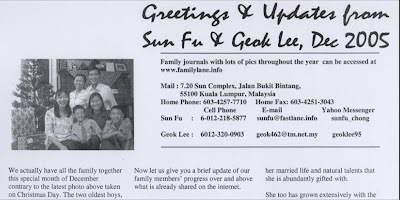 In a blog post of April 2014 on the disappearance MH370, a quick read of it reminds me that it was a year ago when this post was initiated and the intention was to cover my reading of the few books I had acquired that relates to my family history. The same post also covered my Body Mind Spirit multi-sensory approach in communication, writing or solving mysteries or problems of life. In the one year that ensued, I must say I have been busy with this triple base approach in how my time was spent, continuing my focus attention to write and unravel the knot in my mind that I felt I had to undo. It concerned the history and politics of my own country of Malaysia that seem related to the MH370 incident, the history and politics of China as the country of my ancestry also linked to the MH370 incident as the plane was heading to Beijing with many mainland Chinese passengers. A year later after a long time of reading, pondering and doing things of life that I need to do, as I was about to begin to unravel the knot, the founding Prime Minister of Singapore, Mr Lee Kuan Yew who is also of the same Hakka ancestry of our family, passes away which caused me to meditate on his life and write about the history and politics of Singapore. This is a country where about 1.7 million Malaysians primarily of Chinese descent followed him to live and built an economy on an island that Malaysia ousted from the Federation in 1965 just two years after they first joined it due to political differences. My wife being a Singaporean and having her copy of his book with me, I wrote a letter in the form of a blog post to her on her birthday on April 4 believing she would have a chance to meet this great man in the spirit world! It is a big task I'm attempting and the presentation flow starts with information from my personal family history research. From there it leads to historical and political information of the countries involved in my family history derived from my extensive reading of relevant books and writings especially with regards to the History of China, Malaysia and Singapore with good references to internet researched videos or studies by authentic sources or qualified individuals. It is hoped that readers may get the"Ah ha" Eureka effect after reading my completed posts and especially after I have loosened the 'Gordian Knot' of my mind or what others commonly call the writer's block! On the part of this blog post for Family History covering Chinese History as well, this is how the knot was loosened. While I had already visited Medan Sumatra to find the book of my Great Grand father Tjoeng Yong Hian which provided detailed information about him and his life, it had little that revealed more fully about the state of China during his lifetime. I had felt inadequate to know or feel of the politics, freedom and harmony of China at that time. In a trip a year later to Melbourne Australia, I had a reunion with the college girls that I studied with before leaving for Australia. As recorded in this post of the trip, Peter Chen the husband of one of the girls informed me of the writer Han Suyin who wrote many books about the history of the Chinese Hakka people. I went home searching for her books at the local bookstores both in Singapore and Malaysia but couldn't find any. The main reason was that these were pretty old books that were no longer republished for sale. I went online to find that these books are available sold as 2nd hand books in the US and ordered a number of them to be delivered to the home of our family friend Anthony Seow in Utah so that he could bring them to me in one of his frequent trips to Kuala Lumpur. In April 2015, he did make a trip to Kuala Lumpur and passed the books to me! I later met Tony in Orem Utah when I was visiting in Aug 2015! The source of this video with a good chronological list of the dynasties can be found here. Little did I expect that from my personal search of my family history, I would very quickly catch up with China's recent history from the last Qing Dynasty. This came from not only from my reading of the books I had obtained but also from my increased number of trips to mainland China with the following discoveries made when I followed my Hakka ancestry trail as shared in my personal travelogue journal. This is my collection of German trains and tracks that I have kept as my precious Big Boy toys that probably made me choose my author name in blogger that never changed since I started over a decade ago as "Dad the KL City Kid"! You can read more about how this title suits me in my Superman post here. Ah Memories from the Good Ole days videoed on the eve of the New Millennium! Meanwhile, as my written history of China lags behind, our family history has advanced greatly in this next post. The 'next post' mentioned above is what I considered to contain 'spiritual' information as compared to what is normally 'temporal' information that is more commonly written in the world. As a metaphor explained in this article, the spiritual information in the Book of Mormon were referred to as information written on 'the small plates' or 'these plates' while the temporal information were written on 'the large plates' or 'the other plates.' I now like to refer to my 'other plates' here on the history of a Hakka leader named Ye Jianying shared in my journal post here. "I was surprised that this man from my China home province was always present in all the major events of China's negotiation with the US leaders, yet his name was quite unknown to the world, or at least to me. Other leaders like Zhou Enlai and Deng Xiaoping, are far better known and as the above photos portray, whether it was the visit of President Nixon or his National Security Advisor and Secretary of State Henry Kissinger to China to start peace talks with the United States. Reading the wiki link given above of Ye Jianying, it is due to internal politics of the communist party where "His policies deemed too soft, Ye and his local cadres were soon replaced by Lin Biao's, and a much harsher policy was implemented, with Ye's political career effectively over." How did China become modernized? My trips into China in 2015 had satisfied my inquiries about my family history which began in the early 80s. After my latest ground travel tours into various parts of Southern China, my interest turned to an inquiry as to how did China became modernized? From the period of feudal warlords to Emperors and dynasties ruling the country, to end up becoming a communist country which later transformed itself to become a world economic power second only to the United States today, my mind turned to being interested in the political history of this nation with thousands of years of well preserved history of the past. I thought a good start would be from what I learnt, going through 4 halls of history of Ye Jianying in the Hakka country of Meixian in the Guandong Province of China. I would do a quick research of the life of Ye Jianying and his contemporaries. Next was to find out what was the climate of the country at that time in terms of the country's politics and economy, the feelings of the people and the atmosphere of the countries outside China that had an interest in China? Zhu De (1 December 1886 – 6 July 1976) Born poor in 1886 in Sichuan, Zhu was adopted by a wealthy uncle at age nine. Sun Yat-sen (12 November 1866 – 12 March 1925) Born in the village of Cuiheng, Xiangshan County (now Zhongshan City), Guangdong Province. From the list of leaders named above, not including Sun Yat-sen and Chiang Kai-shek, who represented the part of China's brief history of becoming The Republic of China or led by the Kuomintang(KMT) party, they form the early leaders of the Communist Party of China. The KMT was the ruling party in mainland China from 1928 until its retreat to Taiwan in 1949 after being defeated by the Communist Party of China (CPC) during the Chinese Civil War. We can find the names of the leaders from the above list in this wikipedia link that describes the role they played in the generations of Chinese Leadership of mainland China since 1949 under the CPC. 1840-42: The Opium War. British force China to "open" on unequal terms. 1870s: The high point of "statecraft"
1966-76: The "Cultural Revolution Decade"
2008: Tibetan uprisings, earthquake, Olympics. What a year! 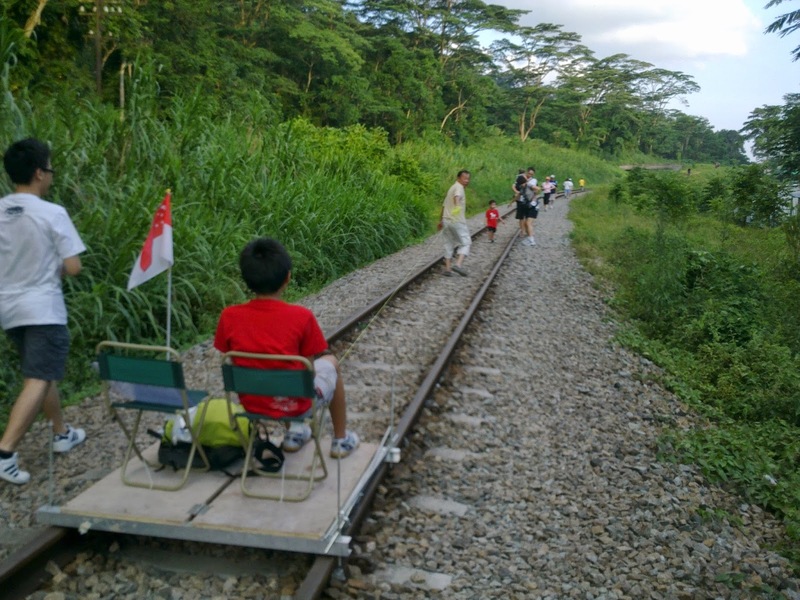 Amidst the crowd of people who came to see the railway tracks for the last time before the authorities would remove them, Mom's creative brother, Uncle Yen Wei brought his custom built aluminium cart to be assembled on the tracks to provide a 'Last Train Ride' for the kids! At last the aluminium cart, with Ray in red on it, was tested to see how it would roll on the railroad track pulled by a human engine. 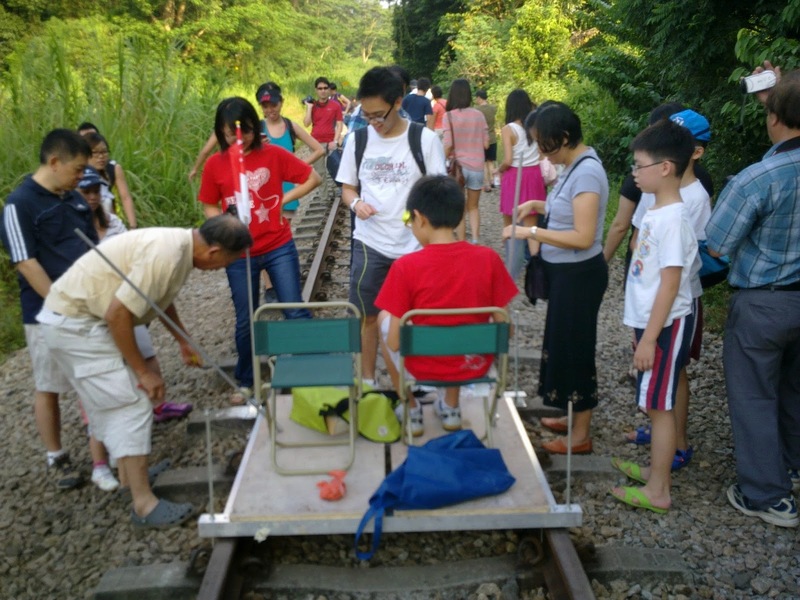 Once it was proven to be successful and safe, the younger kids could be put on the cart too. 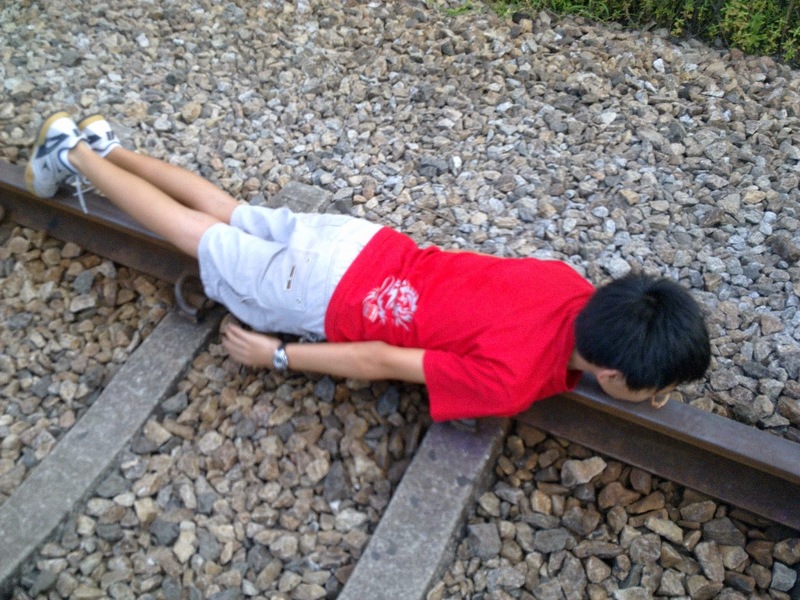 Here is Ray, overdoing it, to show it is even safe to sleep on the railroad itself! When the children of other families saw how fun and safe it was, they all wanted to have a ride too! 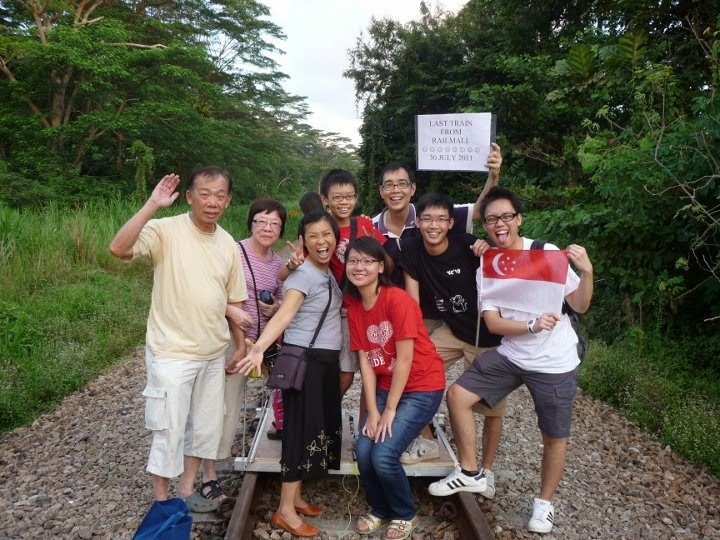 Thanks to Uncle Yen Wei, we all had a memorable and fun family day! 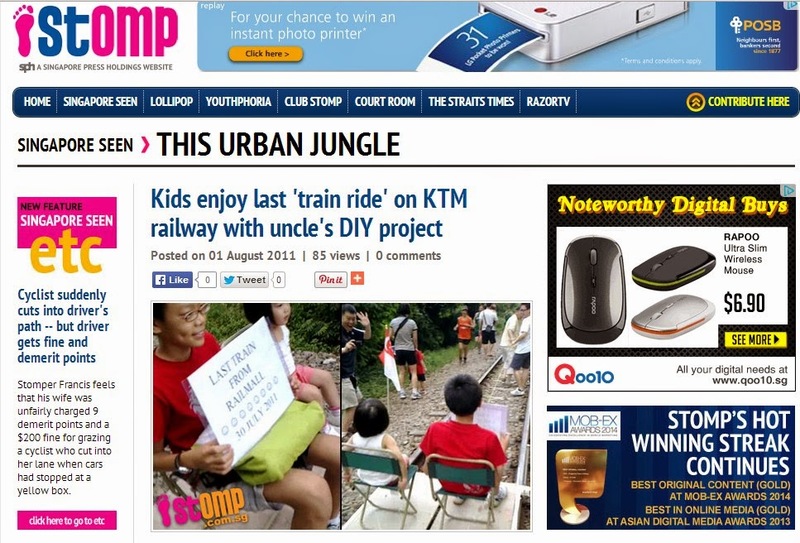 As can be seen, the SLA or Singapore Land Authority has designated the land where the KTM Malaysian trains once use to run on to be for recreational use. 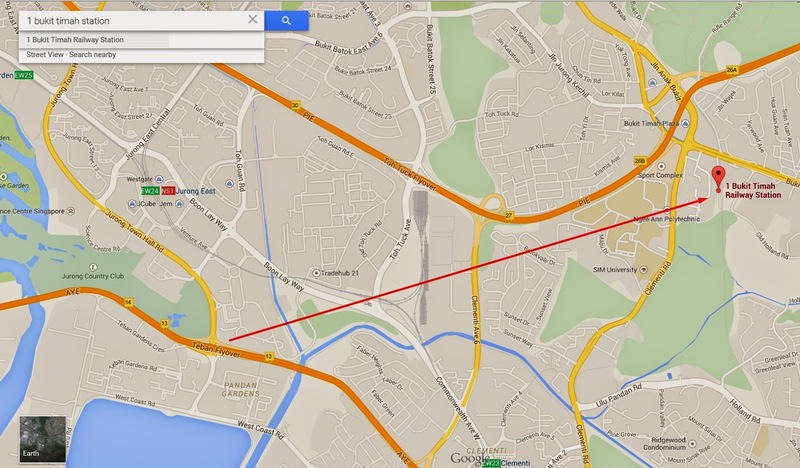 The group starts off from the West Coast from the Jurong area, alighting from the Jurong East MRT station, to head to the direction of Bukit Timah Road area. 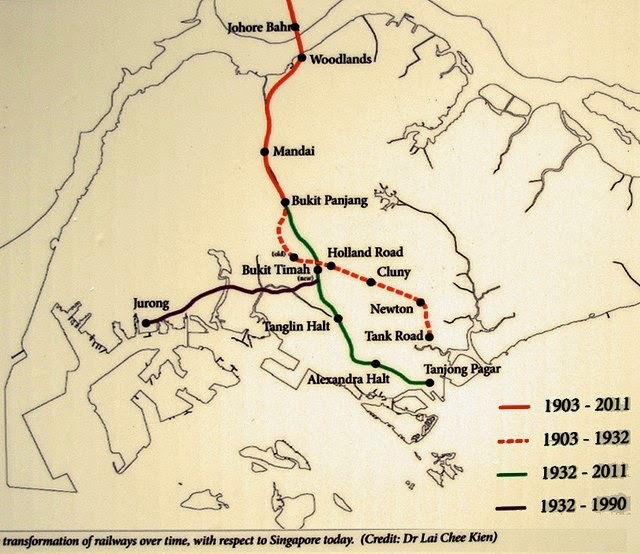 We would essentially hike along the old 1932-1990 old railway trail(the purple line above) to join the newer railway trail of 1932-2011(the green line) that runs through Bukit Timah. ...coming out on the other side. We climbed up to the top of a bridge to a road that enters the AYE highway. This is the view from Google Map street view on the top which can be accessed by clicking here. The photo above was taken on the day of our hike and notice the coconut tree matches the tree seen in the Google Map street view of the earlier photo. This is the view from Google Map street view by moving a little bit further to the front and zooming closer toward the German Centre building as can be accessed here. Notice the view is similar to the photo taken on the day of the hike posted above. Parts of the rails were covered in mud and water, especially in tunnels, but it was still useful to walk on them. It was tricky trying to balance ourselves walking on the narrow rail with water on both sides and we used a branch we broke off earlier to serve as a walking stick. 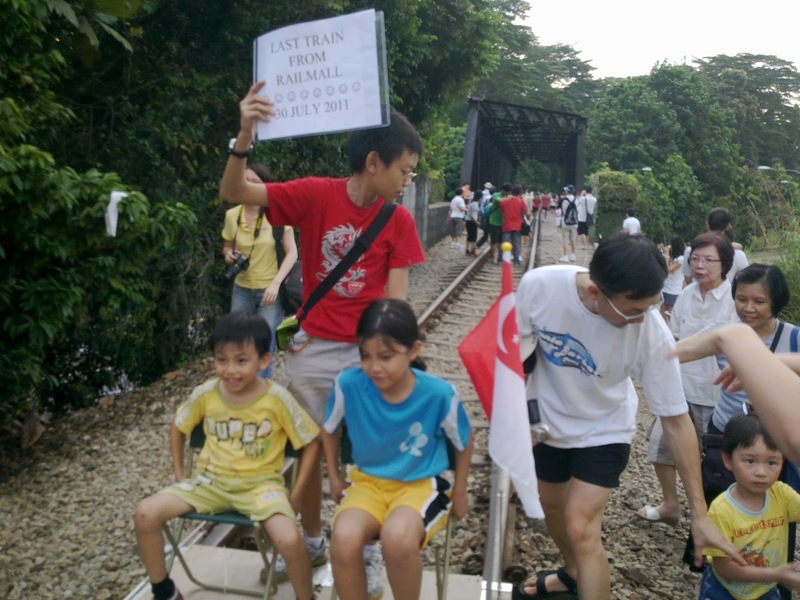 Soon we join up to the newer railroad trail that ran from 1932 all the way to 2011 at the Bukit Timah area. As you can see, only some parts of the railway tracks are kept intact. ... to the railway bridge nearby. The google map photo above shows how far the group had hiked as shown by the red arrow assuming where 'The crow flies' as they say. This map without the red arrow can be viewed here. From the bridge, I can see Rifle Range Road. So you see how the railway track is nicely cut off after the bridge. Half the group including myself walked down after this bridge to Dunearn Road where with just one bus #961, it would take me back right to the bus stop in front of our home. The marvel of Singapore's efficient public transport system without the need for the old railway system. ... someone decided lets take the small path off the tarred road! Suddenly there was a shout 'Bike' and everyone had to squeeze to the side to make way for a mountain biker sharing the narrow trail! As we got further along the trail, someone shouted 'Monkeys' and was pointing up to a tree branch! ...and a few more above us! There was a notice board to show that we were at the Dairy Farm Pass entrance with a map of bike trails. A slope of the hill was practically a vertical wall straight up to the top! No way anyone could climb up I thought! Little did I know some of the hikers were prepared with ropes and hooks! All the way to the top until she could be at the center of the wall in abseiling position like when we were in Pahang caves in Malaysia last December except we slid downwards from the top while this woman scaled all the way to the top! We saw some lovely red 'Jambu' fruits on a tree but being close to the old railway tracks by the housing estate but it looked reserved and not for public consumption! 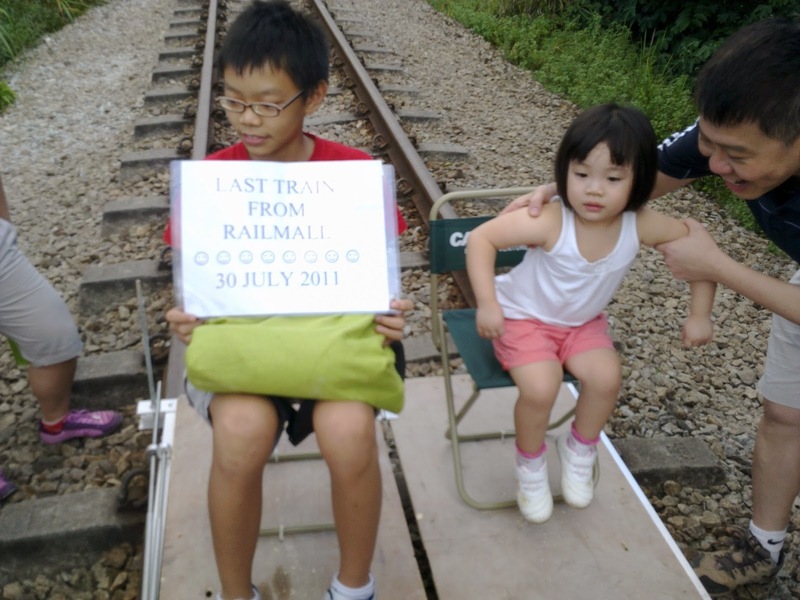 The Rail Mall landmark was passed where over 3 years ago we had the now famous 'Last Train Ride'! journalized at the start of this post. ... with the ability to walk safely into the city without running into cars as the old tracks would go under the highways and avoid noise and pollution of the heavy traffic above! 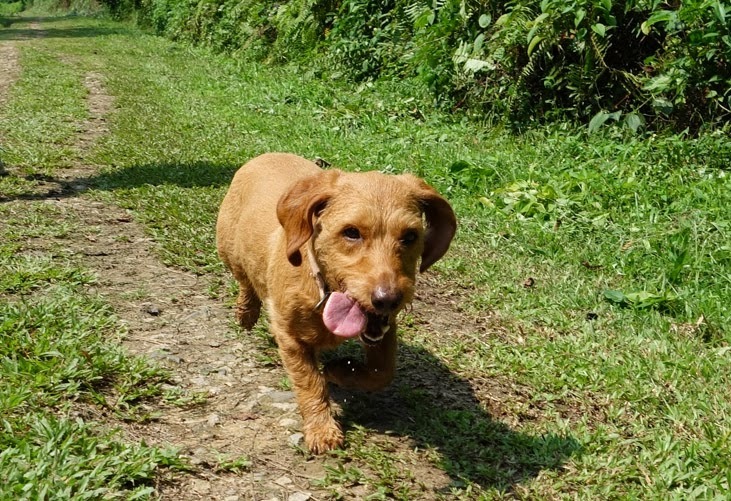 Yes even dogs could be let free to run along the old train tracks without fear of any dangerous vehicles! Cyclists too could transverse the city state island without any danger of heavy vehicles and pollution. The nice part is that hikers on foot could always get out of the old rail tracks at any railway bridge to find the nearest bus stop to head home without any further walking!